Monster yellowfin tuna, double digit striped marlin are already making this a special December for Baja Anglers. 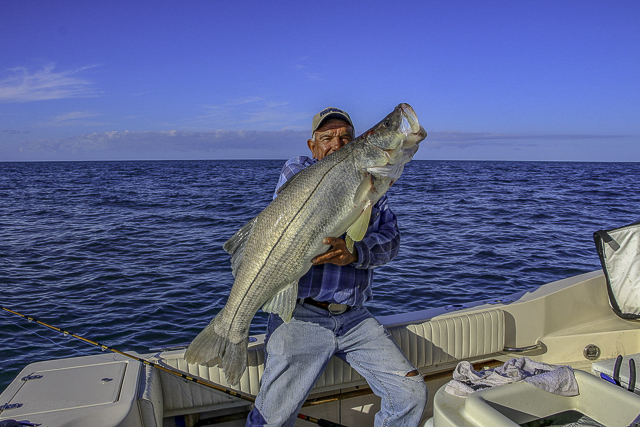 Add in giant snook at Magdalena and some roosterfish on the fly on Baja Sur beaches. Plus some winter dorado at Loreto makes this month a keeper already. What do you want for Christmas? The seizure of commercial fishermen and their panga recently that were capturing and killing marlin illegally at the Finger Bank by CONAPESCA (fish and game department) and the Mexican Navy. Our boats fishing the Finger Bank have seen several boats many times harpooning marlin and using other illegal techniques to catch and sell them — even though it’s illegal to do so — they are a species that are exclusive for sport fishing. 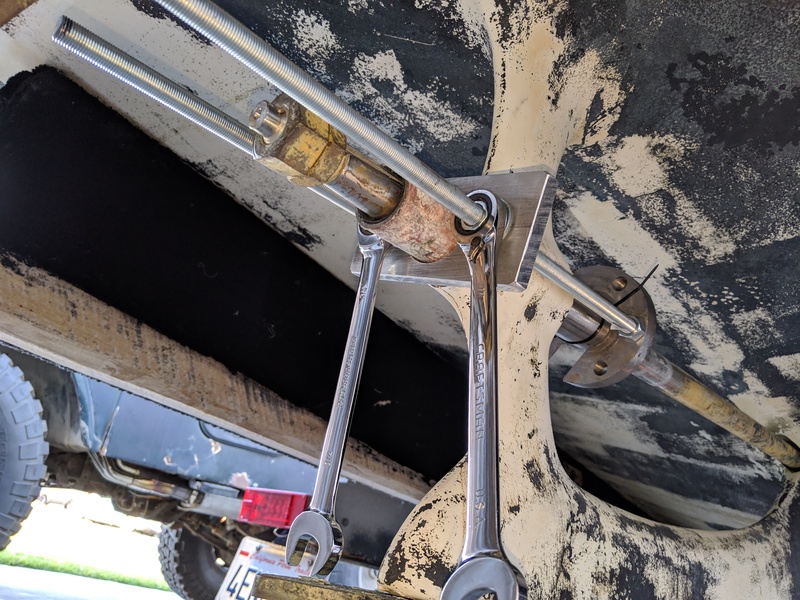 Although our crews have reported these sightings, there was nothing legally they could do unless they were caught in the act. 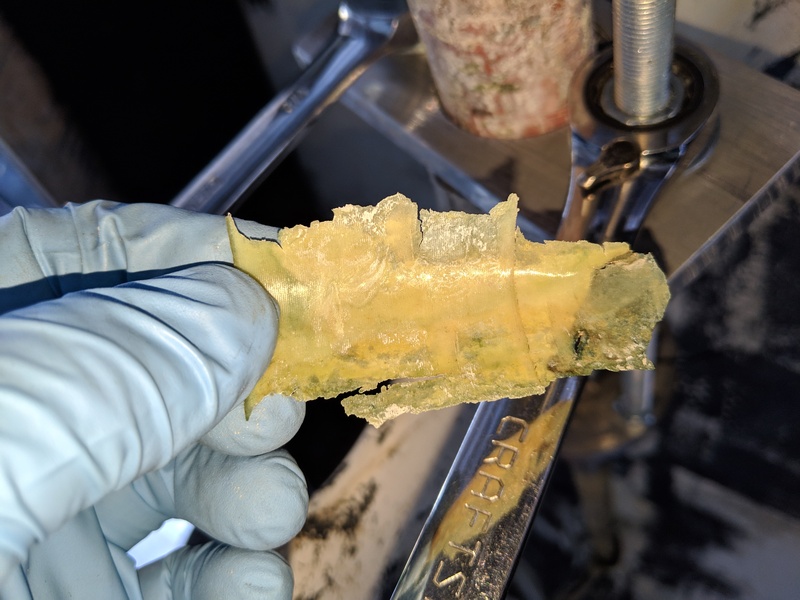 The sportfishing industry and government were able to work together to seize one of the poachers. Of the four pangas of fishermen who were fishing and killing vast amounts of marlin illegally, only one was caught and although they managed to dump much of what they had caught, 8 marlin (only the body, as heads and tails were cut off) were seized along with the illegal fishing equipment. 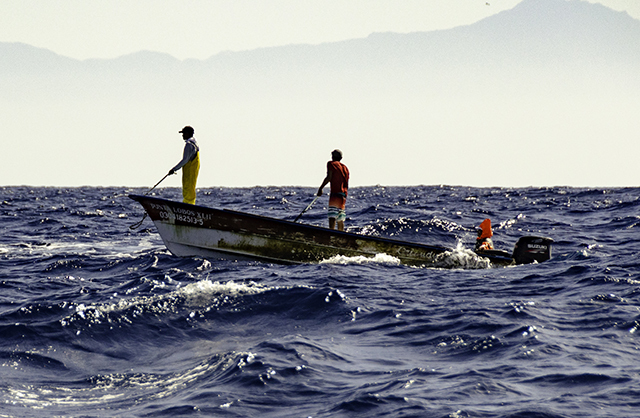 The panga is in government custody and the fishermen have been detained. “Sloppy, choppy” was the report this morning. 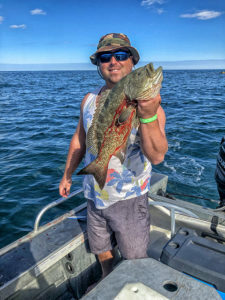 So much so that some half- day trips out of Point Loma stayed inside San Diego Bay and fished sand bass and halibut instead of going outside to fish the kelp beds. A few boats found slow-to-fair at best bite for a 60/40 mix of short-to-legal size calico bass, some short barracuda, a few sheepshead, a bunch of little rockfish, mackerel and a few bonito, plus a few halibut in the flats between shore and the Coronado’s. 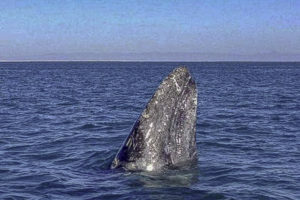 Last Tuesday, November 27, the first sightings of gray whales were recorded in a site near El Delgadito, located in the Vizcaíno Biosphere Reserve in Laguna San Ignacio, municipality of Mulegé. 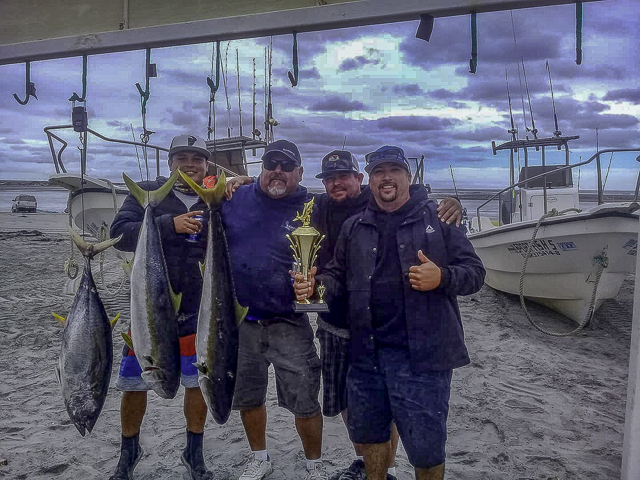 With a mini-tournament of three days of fishing and a group of five fishermen, the competition was very GREAT! The water down this way has been boiling all week with the two hottest species being cabrilla and dorado. 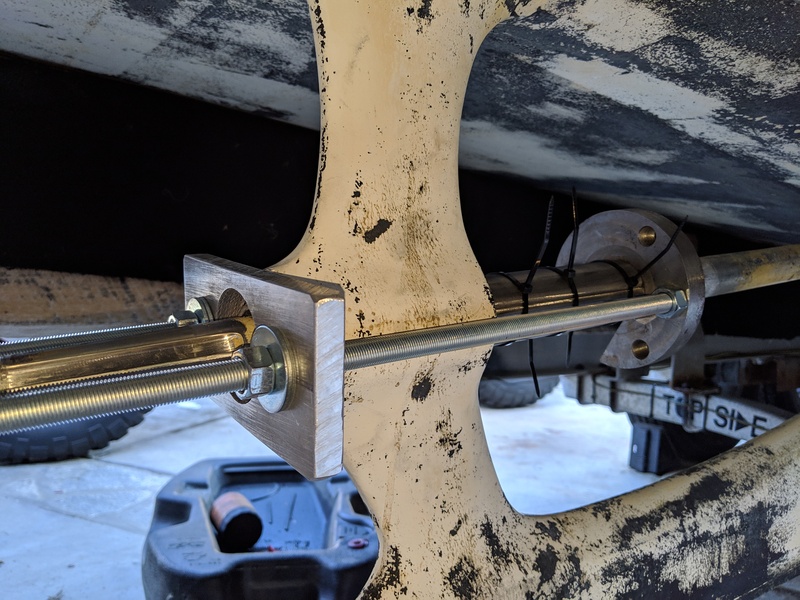 In addition, another species has joined the toothy sierra which has been building momentum as well. A hard-pulling bonito I think it is called. Mexican bonito with pink flesh and teeth makes it really easy to tell from the often-pesky dark-fleshed version. 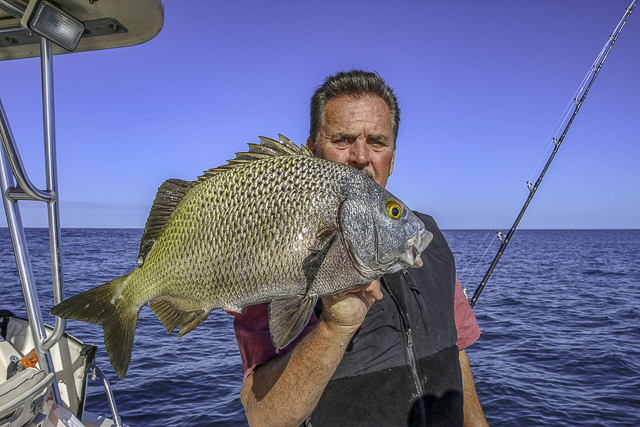 If you catch one of these toothy models, introduce them to a frying pan. Captain Indelacio and Luis holding up a late season dorado just offshore at “el bajo” which is right across the bay on Coronado Island. We have seen big dorado all season and now we are actually starting to put some big ones on ice. Most of the action has been close to town and along the coast. Dorado are hitting in the cabrilla zones and large versions are mixed in. If you have a bait tank full of live sardina, you can almost bet on limits. A few boats made the long run north to Pulpito and hit nonstop limits on cabrilla. 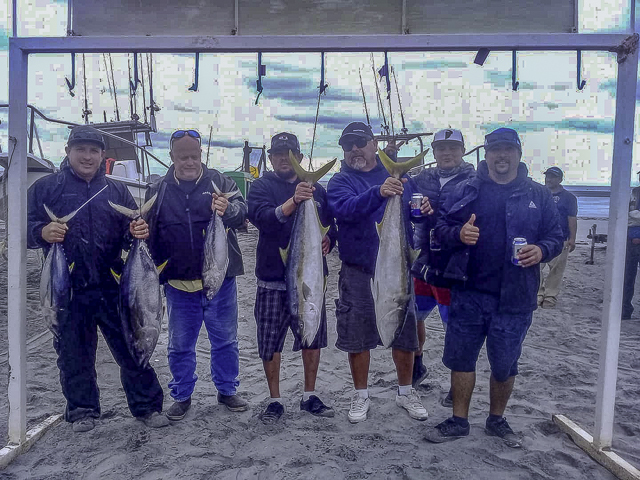 Some nice-sized yellowtail were mixed in with a few fish close to 30-pounds! 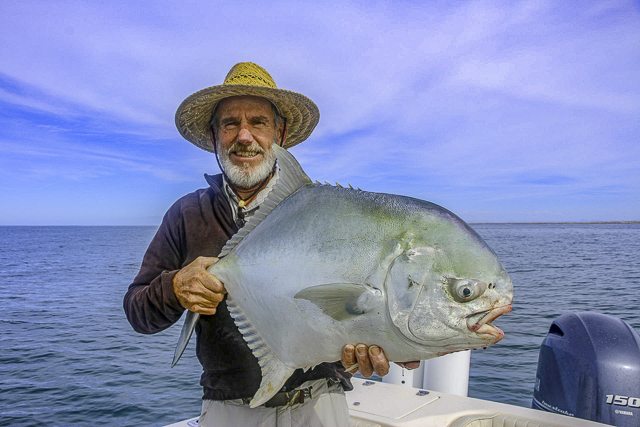 We meet Scott at the Whales Tail Inn, he is a flyfisherman or was, we had him out on the Grady, he caught his largest ever permit and limits of yft. 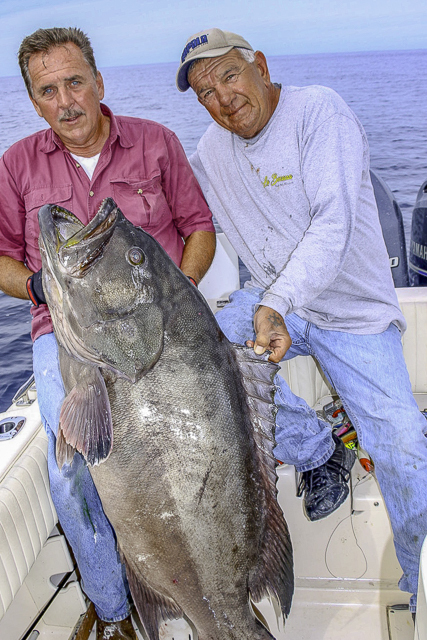 November had outstanding fishing in Mag Bay; Capt. 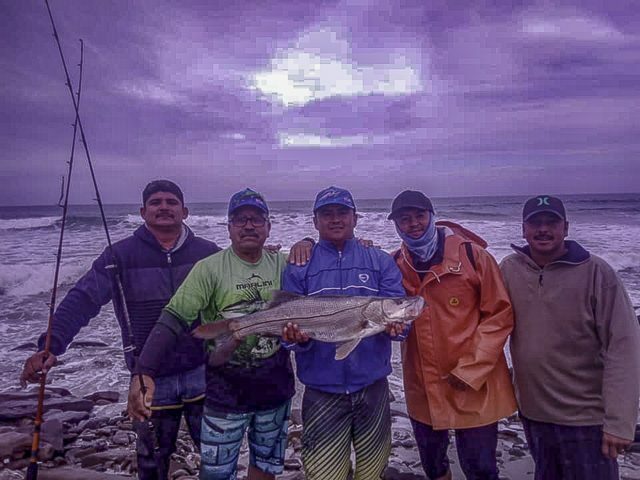 Ruben Duran put Rockodilejohn and Juan Cook, San Quintin, on the fish. 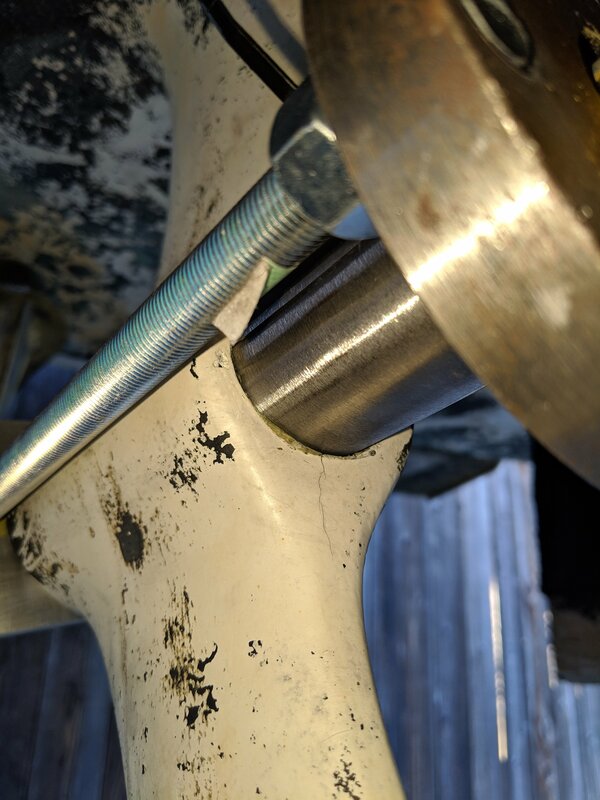 This was their second try there. In early October we were turned around by tropical storm Sofia; then Sergio messed with their plans a few days later. Finally they caught marlin, wahoo, snook, permit and pargo. 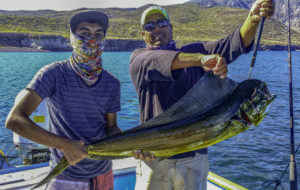 If you dream of the perfect fishing trip with family or friends == we all crave a little adventure in life and the crew at Baja Adventure Co. is here to make it all happen. Both Tobi and McKenzie got into fish … 8 roosters and 6 ladyfish. 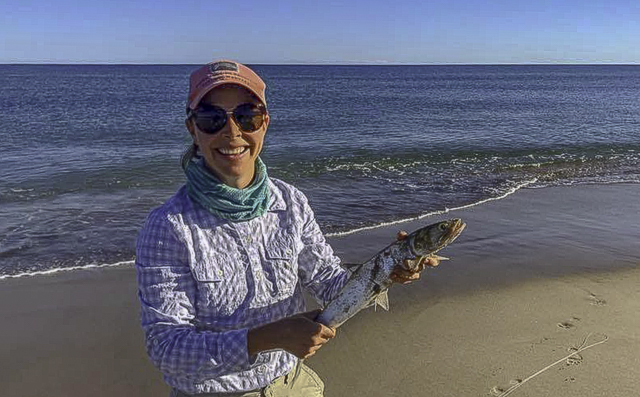 This was McKenzie’s first-time fly fishing the beach and she got 4 roosters and 4 ladyfish! Though north winds have prevailed making for rougher conditions, ocean temperatures have been in the 77- to 79-degree range throughout most of the region. Caballito, ballyhoo and slabs of squid are the main bait available. 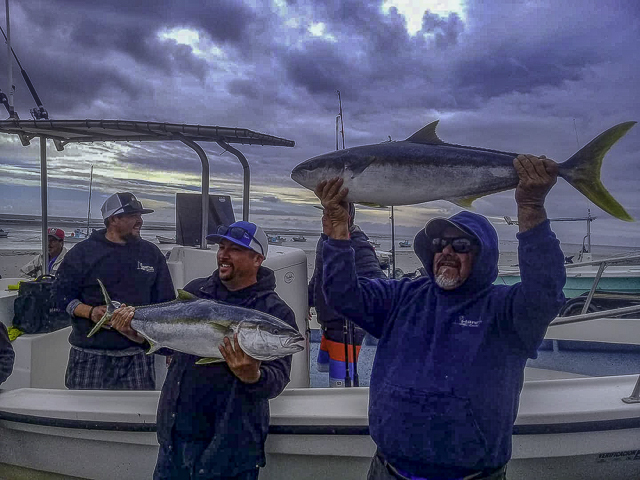 Local fleets were fishing the grounds from Red Hill to Gordo Banks, Iman, San Luis and as far north as Vinorama. On these grounds the main species being found are yellowfin tuna, dorado or wahoo. Not much going on off the bottom besides triggerfish and a few early morning snapper and cabrilla. 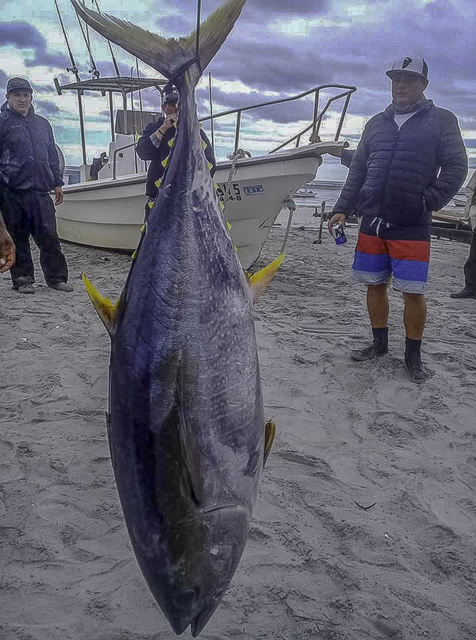 Every day we hear of one or two larger-sized tuna being hooked, most taken off the Gordo Banks — one yellowfin around 220-pounds, another 145-pounder and several other big fish lost. 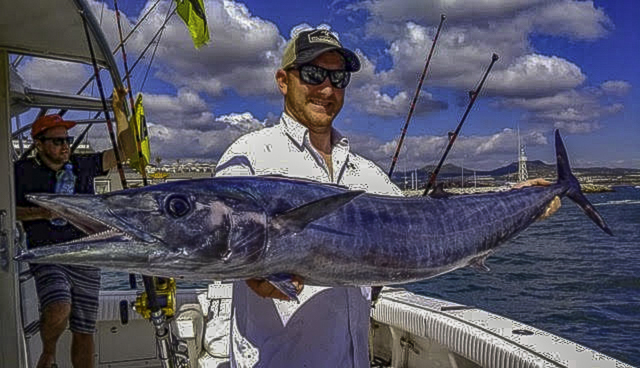 Slow-trolling larger bait or drift fishing strips of squid produced hook ups. Tuna, mostly in the 10- to 70-pound class, were found from Iman to Vinorama, but they were few and far between. Dorado action was very good, especially off Red Hill area, but then it became more spread out. 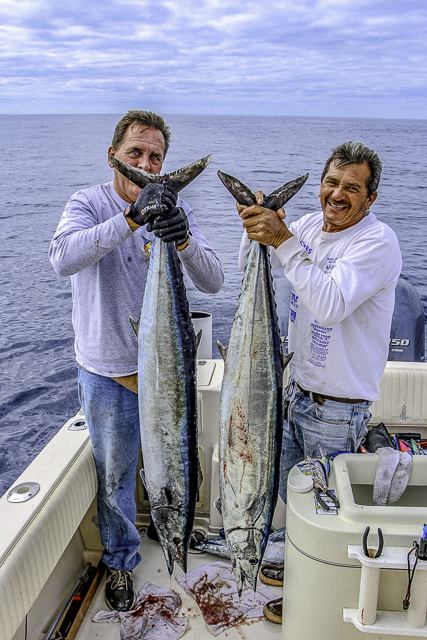 Trolling ballyhoo or caballito seemed the best bet for finding these schooling 20-pound dorado. 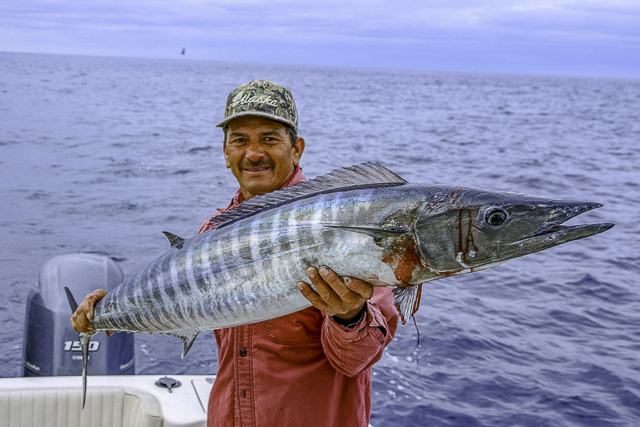 There are a lot of wahoo in the area but getting them to bite has been difficult. 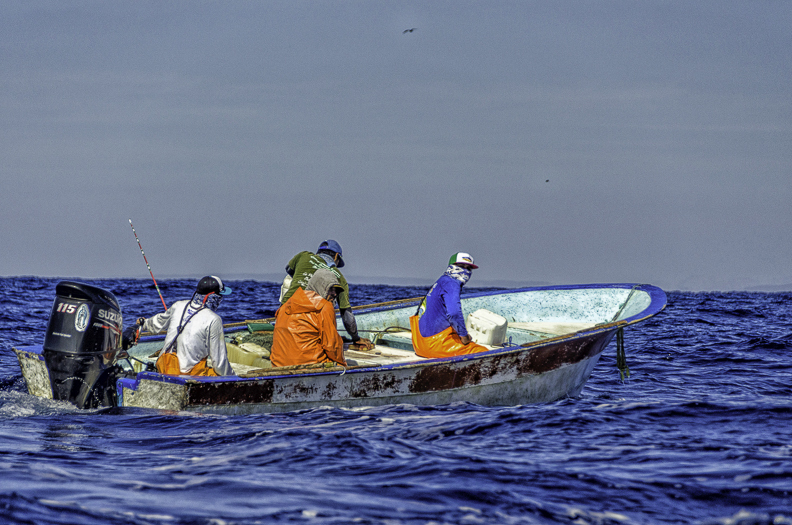 Many are striking while anglers are drifting with squid for tuna. 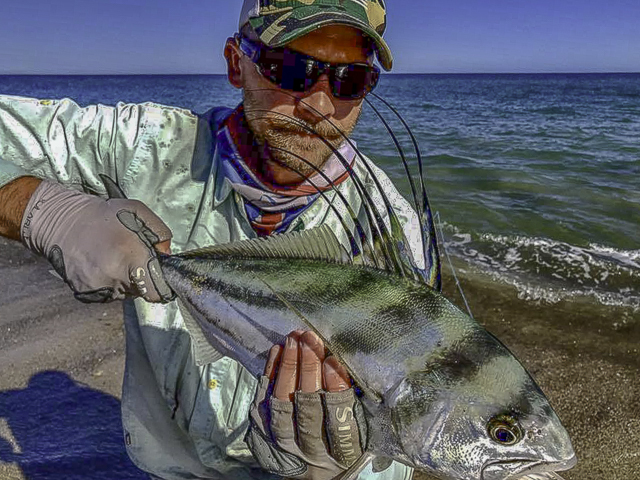 They have not been striking trolled lures, but best chances seem to be on slow-trolled bait, such as caballito or chihuil. With spear fishing season open, the divers are out in force. 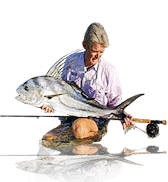 There are far more spear fishermen congregating on the same grounds with the rod and reel anglers which makes the fish much spookier and more elusive. 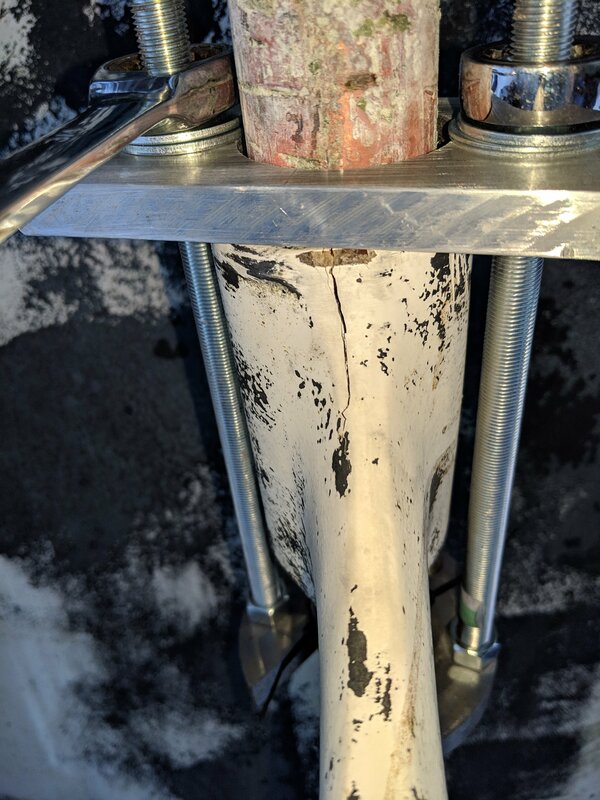 Inshore areas are fragile and cannot sustain such pressure. 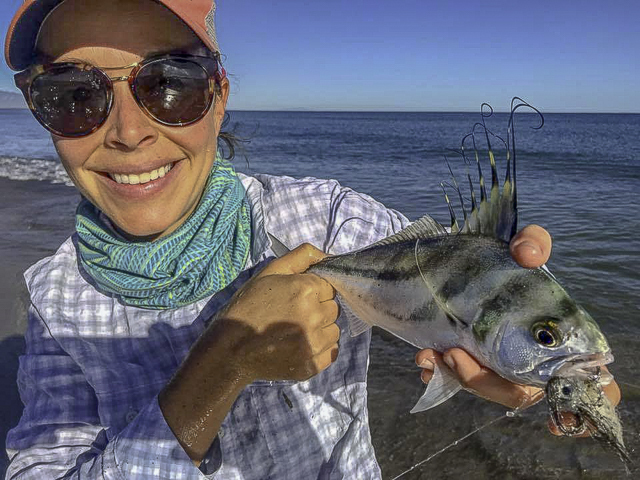 Along the shoreline there have been mostly smaller roosterfish and jack crevalle, but we have heard of an occasional larger rooster caught and released. 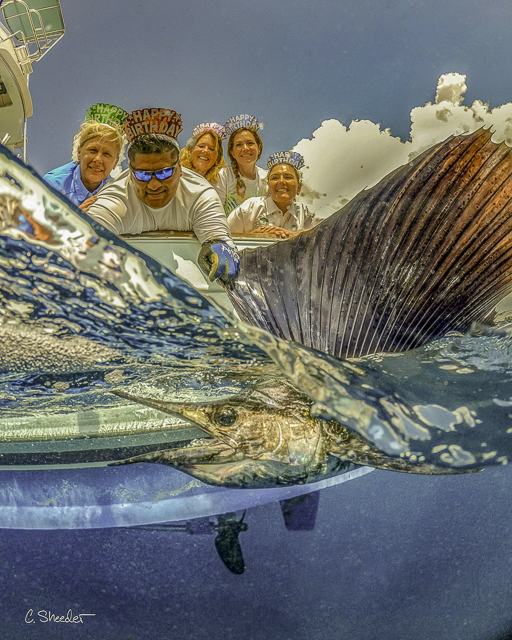 Numbers at a glance: Billfish 72%, tuna 7%, dorado 82%, other species 7%. The Finger Banks are still producing marlin in the double digits, including a personal, record-breaking 60 striped marlin caught and released on November 27 by Pisces 32-foot Bill Collector with owner Mark Chiavetta aboard. (He also caught and released two silky sharks and landed a few dorado). 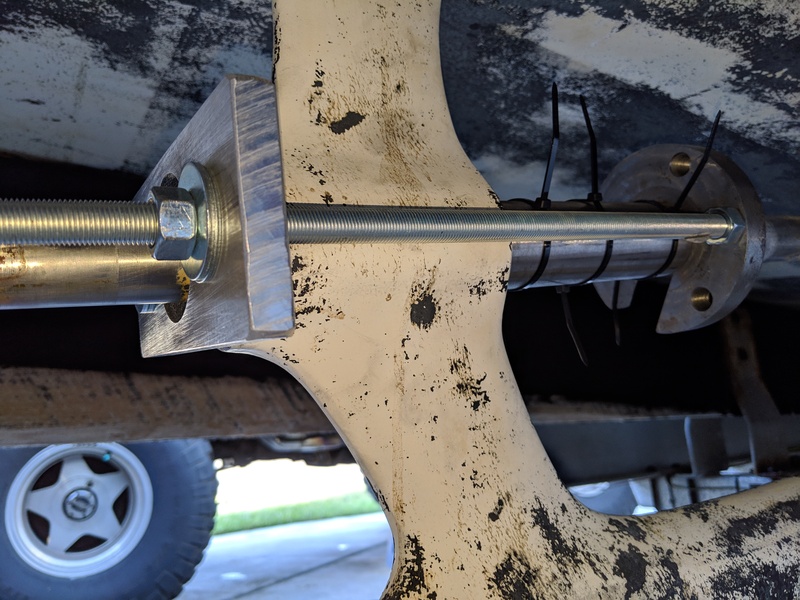 However, the marlin aren’t just at the Finger Banks. There are strong marlin numbers closer to Cabo, from the Old Lighthouse to the Las Margaritas area. 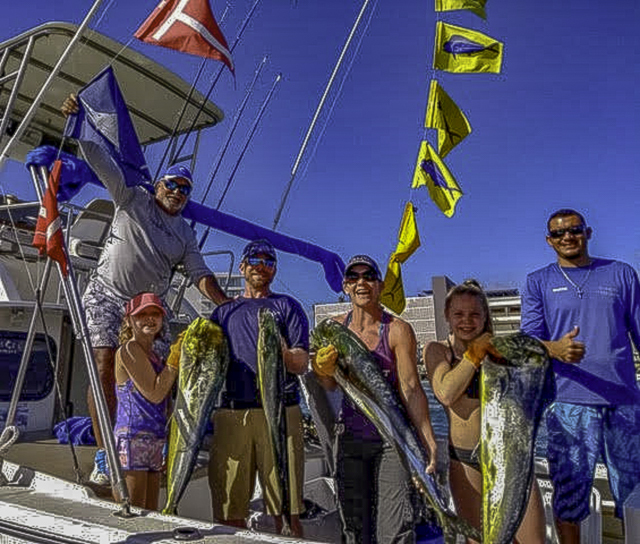 Double-digits of dorado have also been common with the boats in the area respecting the catch limits and releasing. 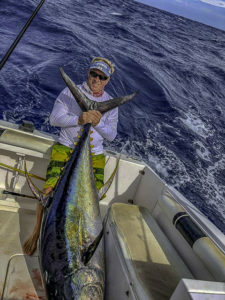 Tuna are still around as well, although anglers have been targeting the other species. Cabo Climate: The good news is the forecast is for mostly sunny to partly cloudy skies with little rain. Winds are expected in the gentle 7- to 8-mph range. Humidity is expected to run in the mid-60s. Sea Conditions: Seas have been calm in the mornings with some swells in the afternoons. Sea temps are running from 77- to 80 (Pacific side) to 79- to 81 around the inside corner to the Gordas. There are reports of a plume of warmer water running from the Golden Gate down to the San Jamie which has been productive. 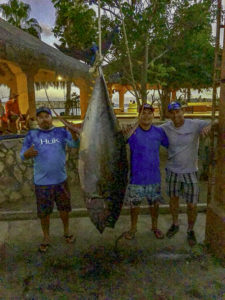 Best Fishing Areas: Good counts of marlin are showing up around Cabo Falso, the Lighthouse and out to the San Jamie and Golden Gate Banks. 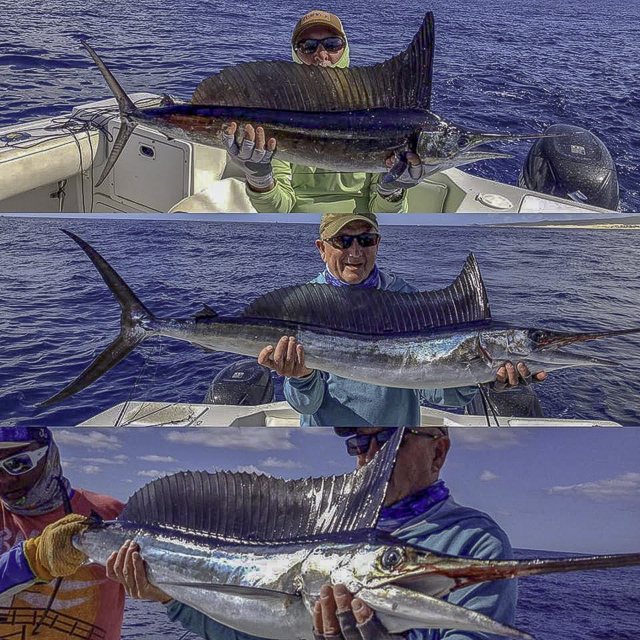 Sailfish and striped marlin counts are good from the Lighthouse north along Migrino and quality dorado have moved north on the Pacific side along Migrino as well. 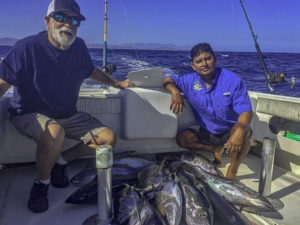 The yellowfin tuna are being found 15 to 25 miles out from the Herradura west to the San Jamie Bank. 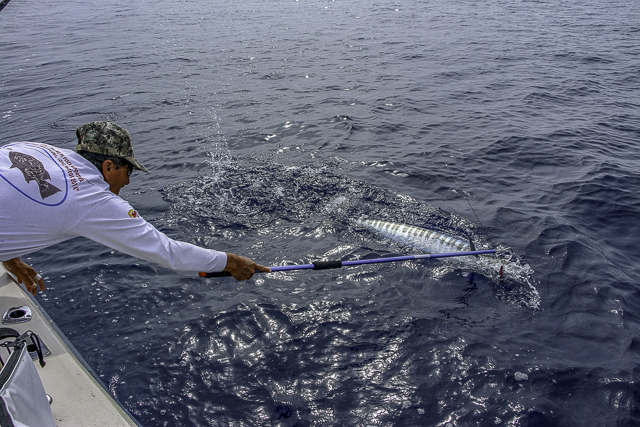 The Finger Bank has been producing double-digit striped marlin counts with a few boats reporting over 20 fish per day. Best Bait & Lures: Feathers and cedar plugs have been the favorite for the tuna and trolled smoke trail lures the favorite for the blue and black marlin. 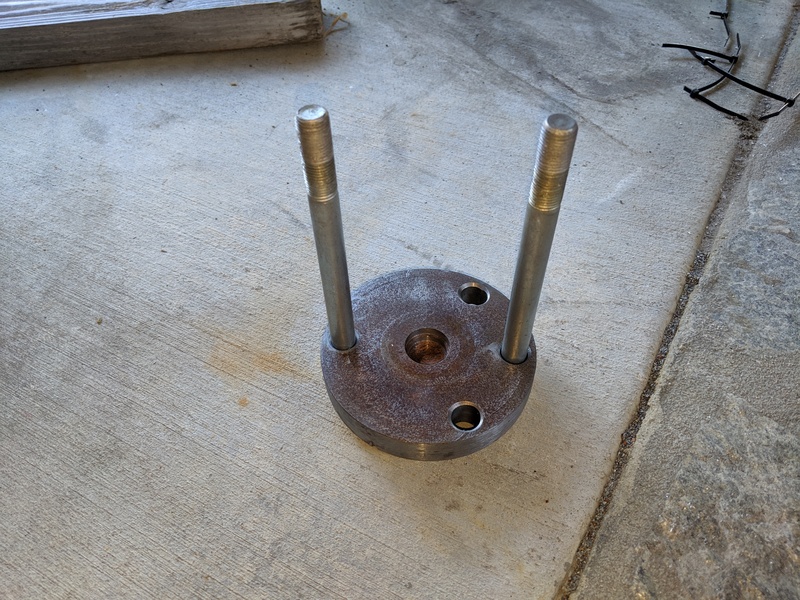 Live bait tossed to tailing stripers was also successful. Soaking live bait around the Finger Bank produced multiple striper counts. 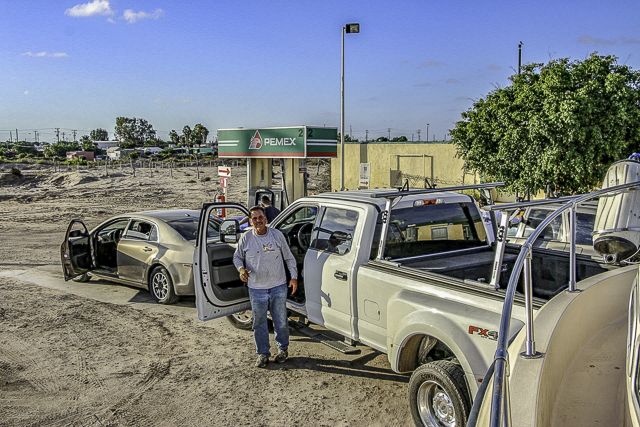 Bait Supply: Live bait is available at the $3.00 per bait upon exit from the harbor. 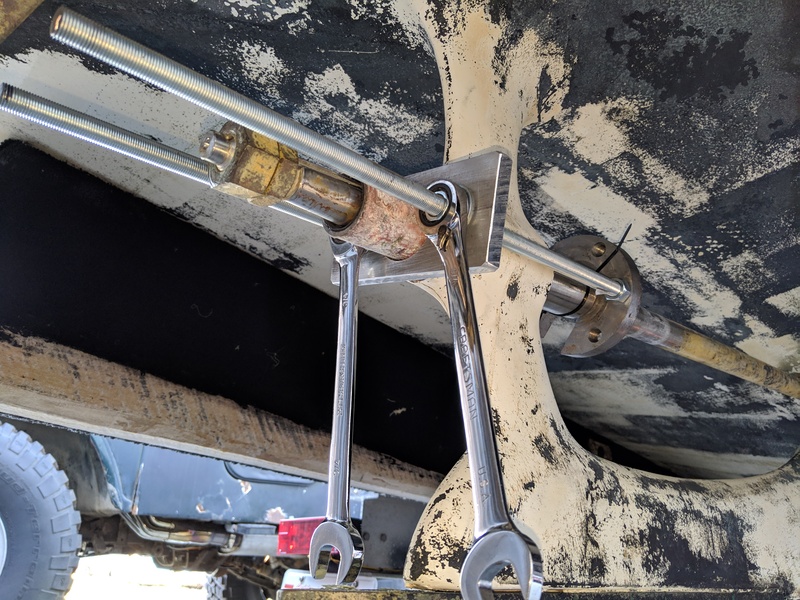 With recent tournament action and an increase in seasonal traffic, live bait has become scarce at times. Fishing was outstanding Chuck Stanley caught the coveted Spearfish on the fly Twice actually HE GOT TWO SPEARFISH ON THE FLY WOW!! !